Preheat oven to 450°F and place rack in the middle of the oven. Whisk together 3 tbsp olive oil, lemon juice, water, garlic, shallot, crushed red pepper, and 1/4 tsp each of salt and pepper until salt has dissolved. Stir in parsley. Let chimichurri sauce stand for 20 minutes. Pat fish dry, then sprinkle each fillet with some salt and freshly ground pepper. Heat 2 tbsp olive oil in a large skillet over medium-high heat. Place both fillets in the skillet and pan-sear for 5 minutes. Flip the fillets over and place in the oven. Bake for 6 minutes or until fillet is fully cooked through. 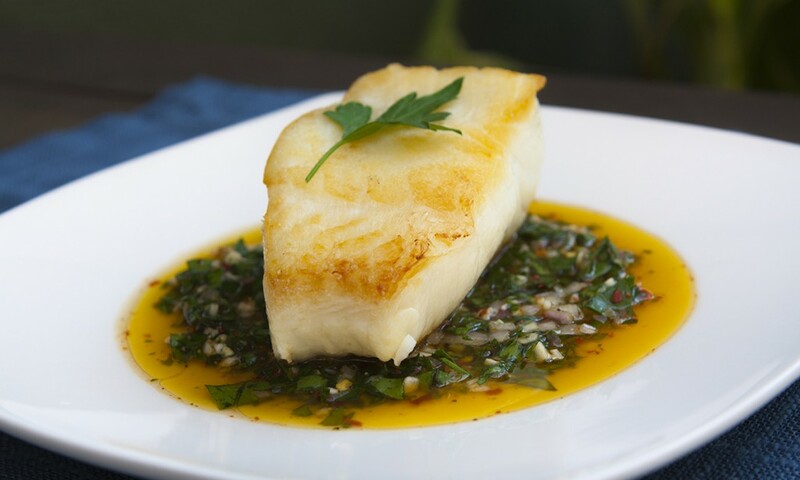 Serve fish drizzled with some of the chimichurri; serve remainder on the side.